Was born in 1840 at Glasgow, and educated at Glasgow High School and the University. Norman, Cutter, 40 tons. Prof. D. W. Finlay. 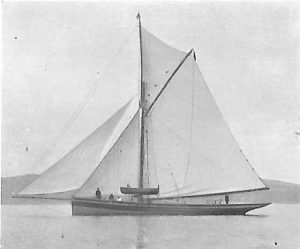 He commenced yachting early in life, and in July, 1857, he sailed his first race in the Leda, a 7-tonner, which was built by Fife for his elder brothers. In the Torch (15 tons), and in Kilmeny, 30 tons (also by Fife), Satanella, 15 tons (by Aldous) and Phantom, 27 tons (by Pinney of Poole), he was joint owner with his brothers. He subsequently owned the Playmate, 20-tonner (by Ratsey), and the Norman, 40-tonner (by Hatcher). All these yachts were racers, and figured very largely in the history of yacht-racing on the Clyde and in the South of England. The careers of these famous boats is fully dealt with in the section of this volume dealing with the history of yachting. Clubs: Royal Clyde, Royal Northern, Clyde Corinthian. Residence: 2, Queen’s Terrace, Aberdeen.